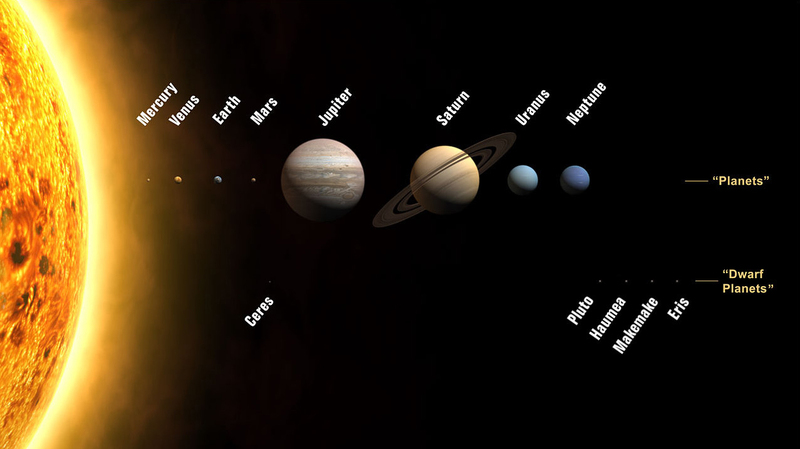 The planets of the solar system are shown in sequence and in relative size (but not to scale in terms of their true separation from one another). 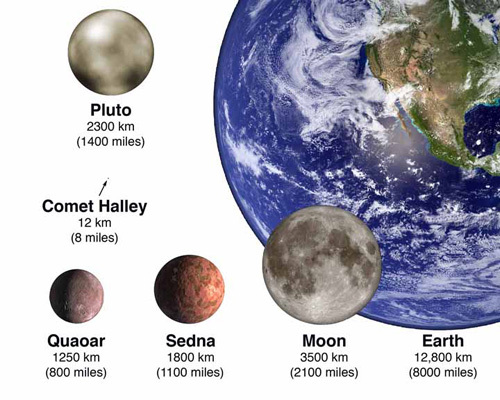 Pluto is about 5.5 times smaller than Earth, or about two-thirds the diameter of the Moon. 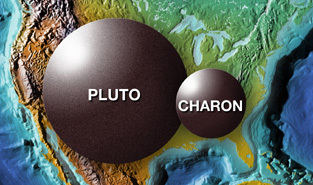 Side by side, Pluto and Charon would barely span the United States. The next-largest objects in Pluto's Kuiper Belt neighborhood – at least among the objects we've discovered so far – are Eris and Makemake. 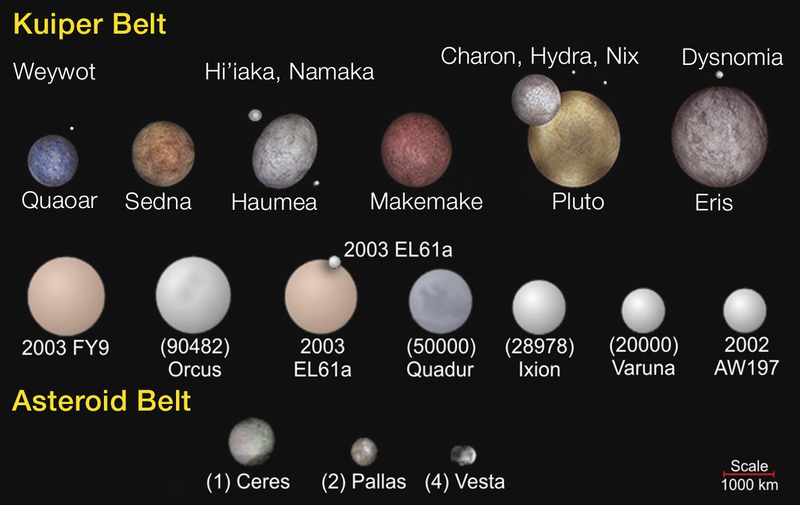 Here's a look at relative sizes of known small planets in the Kuiper Belt and Asteroid Belt. A person on Pluto would weigh 1/15 of what they weigh on Earth — a nice way to lose weight, but a chilly way to do it! For comparison, the astronauts walking on the Moon weighed 1/6 of their Earth weight. Since the mass of Pluto is 1/455 that of Earth, you might guess that the gravity would be 455 times less. But also take into account that Pluto is 5.5 times smaller than Earth, so someone on Pluto's surface would be 5.5 times closer to the planet's center of mass. Since the force of gravity decreases with the square of the distance from the center of mass, the gravity on Pluto will be changed by a total of (5.5 x 5.5) / 455, equals to 0.07 or 1/15. Most planets have poles that point roughly up and out of their orbit planes — the exceptions are Uranus and Pluto, which effectively rotate on their sides. Like most satellites, Charon orbits around Pluto's equator. Click here for a discussion of how this unusual orientation of Pluto and Charon produced mutual eclipses. Pluto's orbit is less circular - more elliptical or "egg-shaped" - than those of the other planets. Pluto's 248-year-long orbit has an eccentricity of 0.25, which means that Pluto's distance from the Sun is as little as 29.7 astronomical units (temporarily bringing it closer than Neptune) and as great as 49.3 astronomical units. For about 20 years in each orbit, Pluto is actually closer to the Sun than Neptune. Most of the planets orbit the Sun close to the same plane (called the ecliptic). Pluto's orbit is tilted (by 17.14 degrees) with respect to this plane, the highest inclination of any planet in the solar system. Mercury's inclination is second highest at 7 degrees. The picture below is a "sideways" view, looking at the solar system from the side and a little above the ecliptic plane. Pluto and Charon both spin and orbit every 6.4 days. The animation illustrates the effect this has by putting people on Pluto and Charon and imagining what they would see in the sky. The "blue" people would see the other object up in the same place in the sky all the time. The "red" people would never see the other object – so if you are on Pluto you would not know Charon is there. And if you were on Charon, you would not see Pluto. Pluto's 248-year long orbit is less circular - more elliptical or "egg-shaped" - than those of the other planets. Pluto's orbit has an eccentricity of 0.25, which means that Pluto's distance from the Sun is as little as 29.7 AU - temporarily bringing it closer to the Sun than Neptune - and as great as 49.7 au. For about 20 years in each orbit, Pluto is actually closer to the Sun than Neptune. While all of the other planets have orbits that are close to the ecliptic, Pluto's orbit is inclined by 17 degrees. While Pluto's orbit is close to Neptune's, the planets won't collide since their orbits are in an exact resonance. 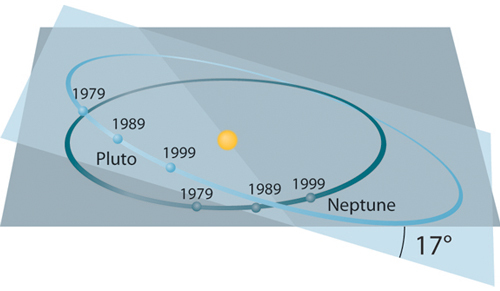 Pluto orbits the Sun twice for every three orbits of Neptune. As a result, Pluto and Neptune are never very close to each other. This is strong evidence against the idea that Pluto is an escaped moon of Neptune. Imagine an observer looking down on the solar system from 18 billion miles (30 billion kilometers) above and watching Pluto from the time of the U.S. Declaration of Independence in 1776 through historic events of the past couple of centuries. By the time the planned New Horizons mission makes its flyby of Pluto in 2015, the dwarf planet will have made almost a complete orbit of the Sun. The period around Pluto's closest approach to the Sun - known as perihelion - was a busy time for Pluto events! Click the graphics below for a closer look. These diagrams were made using data from the Jet Propulsion Laboratory's Solar System Simulator. The diagrams below show the resonance of Neptune's and Pluto's orbits another way. 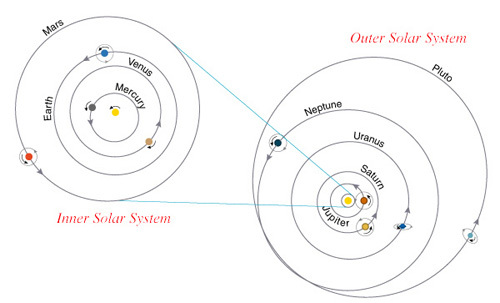 The upper diagram looks down on the solar system from above the Sun. The lower diagram "fixes" Neptune and the Sun, following the planets' orbits over thousands of years. Check how Pluto's eccentric orbit maps out a strange, curly path — but never comes close to Neptune. The story of Pluto's discovery begins with Percival Lowell, the founder of Lowell Observatory in Flagstaff, Arizona. Lowell was obsessed with the notion of a "trans-Neptunian" planet, which he believed could be detected from the effect it would have on Neptune's orbit. After all, the planet Neptune had been discovered in 1846 by examining irregularities in the orbit of Uranus. Astronomers reasoned that the mystery planet's apparent gravitational influence on Uranus and Neptune could be used to calculate where in the sky it should be found. Lowell was one of several people (William H. Pickering was another) who hunted for Planet X by computing orbits and carefully searching the sky where they concluded the new planet ought to be. Lowell founded an observatory and funded three separate searches for Planet X. He died in 1916 without discovering it, but the search continued at the observatory. In 1929, a special camera-equipped telescope with a 13-inch objective lens was built specifically for this search. Observatory director Vesto Slipher hired a young man from Kansas to conduct the third search — a move that led to Clyde Tombaugh becoming the first American to discover a planet. Amateur astronomer Tombaugh was hired to expose photographic plates with this new camera by night, and to carefully compare the plates by day using an instrument called a blink comparator. On February 18, 1930, Tombaugh finally found what he was looking for: a tiny spot of light moving slowly against the fixed pattern of stars in the constellation Gemini. 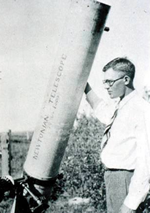 Read more about Clyde Tombaugh. Tombaugh and his mentors couldn't even have forecast how fascinating their new planet would turn out to be. In a 2005 article, New Horizons Principal Invesigator Alan Stern describes this amazing space discovery. The Roman god of the underworld, also known as god of the dead, is Pluto. The journey to the underworld leads the dead to Styx, the River of the Dead. Here, they are required to pay a toll for the ferry. 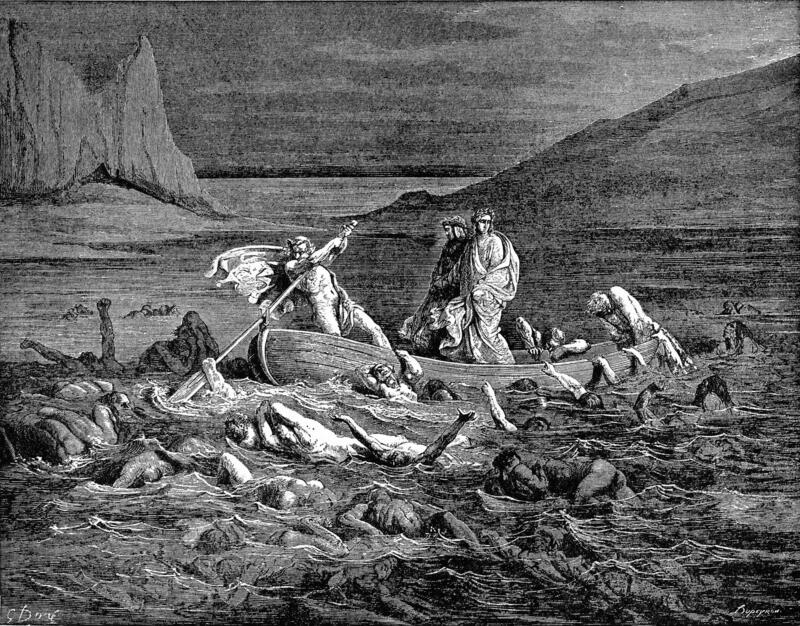 Charon, the ferryman, collected this toll, which was paid for with a coin buried with the dead. Next, the dead must cross the path of Cerberus, a three-headed dog that only allows the dead to pass by. The final challenge before reaching the underworld was to face the judges of the dead. Pluto chose the position as ruler of the underworld after he and his brothers conquered and divided their father's rule of the world. In the beginning, Pluto was seen as a cruel god because he ignored the prayers and sacrifices made in his honor. His image softened with time and he was viewed by later cults as a kinder, more gentler god. Pluto eventually took a goddess, Proserpine, maiden of spring. He emerged from the underworld and swept her up in his chariot. Proserpine became goddess of the dead. Although her fate was in the hands of Zeus and she was only obliged to stay with Pluto for half of the year and return to her mother the other half, hence the change from winter to spring. Something deep-seated in human nature calls on us to name things. It's almost as if a thing isn't real, or whole, until we name it — and so, X had to have a name. Suggestions flooded in: "Zeus," "Cronos," "Lowell," "Minerva." Widow Lowell first liked "Zeus," but later suggested "Percival," then "Lowell," and then, finally, "Constance," her own name. Dozens of other well-meaning suggestions came pouring in as well. Then there were hundreds, then thousands. But when all was said and done, the moniker for the newly discovered X that the Lowell staff preferred was the one suggested* by 11-year-old Venetia Burney of Oxford, England: Pluto — Pluto, the Greek god of the Underworld; the brother of Jupiter, Neptune, and Juno; and third son of Saturn, who was able, when he wished, to render himself invisible. Both the American Astronomical Society and the UK's Royal Astronomical Society adopted Pluto as the official name and as the official symbol for the new world. was Percival Lowell's monogram. *The French astronomer P. Reynaud had suggested Pluto as the natural mythic name for Lowell's putative Planet X in 1919, but this was not remembered until 1930. Planet X was subsequently christened Pluto in 1930, a name suggested by Venetia Burney, an 11-year-old girl in Oxford, England. This name was favored by the astronomers of Lowell Observatory because its first two letters were the initials of Percival Lowell. In hindsight, the discovery had nothing to do with Lowell's calculations based on perceived perturbations to the orbits of Uranus and Neptune. We now know that those perturbations were not real, and that Pluto's mass is much too small to have produced such perturbations in any case. The discovery owes more to the remarkable persistence and diligence of Clyde Tombaugh in his careful search of the sky. Venetia Burney (b.1919) was the first person to suggest the name Pluto for the planet discovered by Clyde W. Tombaugh in 1930. She lived in Oxford, England, and was 11 years old at the time. Interestingly, her great-uncle Henry Madan (who lived from 1838 to 1901 and was Science Master of Eton, a famous private school in England) had suggested in 1878 the names Phobos and Deimos for the moons of Mars. 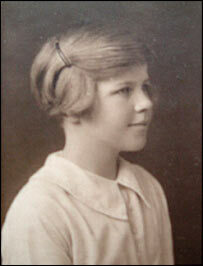 Venetia Burney grew up to become a teacher. She married a mathematician named Maxwell Phair. She lives in Epsom, England, with her husband and has a 55-year-old son. An account of how Venetia Burney was learning about the planets at school at the time of the planet's discovery is given in a news letter of Parents' Union School (an english movement for home-schooling). One of New Horizons' top science goals was to make maps of Pluto and Charon, revealing details that we simply can't see from Earth. In fact, even with the best telescopes and technologies on the ground and in space, Pluto and its moons look like tiny dots of light in the sky with hardly any visible details. Here is a sampling of ground-based and space-based telescope images of the Pluto system. This picture was taken by the Keck Telescope, Mauna Kea, Hawaii. Note that the colors do not indicate the colors of Pluto and Charon, but the brightness of light (in the same way that contours show height on a topographic map). 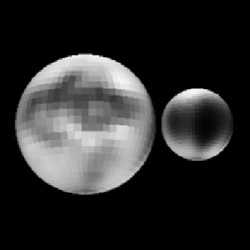 And because the light from Pluto and Charon is scattered by the Earth's atmosphere above the telescope, the images of Pluto and Charon are also blurred - their actual sizes are much smaller than they appear in this image. The quality of its 8.3-meter primary mirror and the stability of the atmosphere above Mauna Kea, Hawaii, allowed the Subaru Telescope to provide clearly separated images of Pluto and Charon using its Cooled Infrared Spectrograph/Camera. This image is produced from three 2-second exposures taken through infrared filters on June 9, 1999. Click here for more information about this image. Credit: Dale P. Cruikshank, Catherine de Bergh, Sylvain Dout, Thomas R. Geballe, Tobias C. Owen, Eric Quirico, Ted L. Roush and Bernard Schmitt; published in Science (vol. 285, p.1355), 1999. This is the first image-based surface map of Pluto. 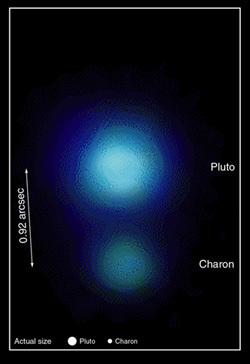 This map was assembled by image-processing software from separate blue-light images of Pluto's disk taken with the Hubble Space Telescope. Hubble imaged nearly the entire surface as Pluto rotated in late June and early July 1994. The map, which covers 85% of the planet's surface, confirms that Pluto has a dark equatorial belt and bright polar caps. Pluto is an unusually complex object, with more large-scale contrast than any planet except Earth. Pluto itself probably shows even more contrast and perhaps sharper boundaries between light and dark areas than is shown here, but Hubble's resolution (just like early telescopic views of Mars) tends to blur edges and blend small features sitting inside larger ones. The two smaller inset pictures at the top are actual images from Hubble. North is up. Each square pixel (picture element) is more than 100 miles across. At this resolution, Hubble discerns roughly 12 major "regions" where the surface is either bright or dark. The larger images (bottom) are from a global map constructed through computer image processing performed on the Hubble data. 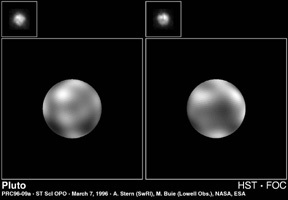 Opposite hemispheres of Pluto are seen in these two views. Some of the variations across Pluto's surface may be caused by topographic features such as basins, or fresh impact craters. The picture was taken when Pluto was at a distance of 3 billion miles (roughly 5 billion kilometers) from Earth. Credit: Alan Stern (Southwest Research Institute), Marc Buie (Lowell Observatory), Larry Trafton (McDonald Observatory), NASA and the European Space Agency. 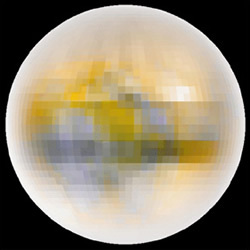 Click here to make your own Pluto globe! 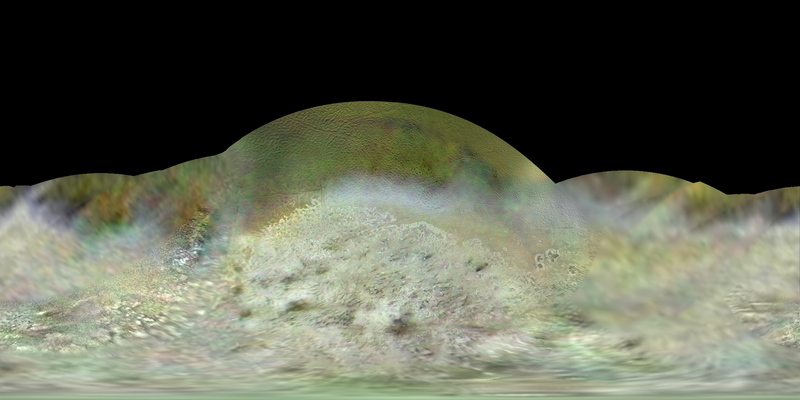 This image was constructed by combining maps of Pluto viewed through filters that select blue and green light. The colors were then increased (saturation) to make them more visible (and less realistic). Only the center of the disk has color information, and hence the grayness of the circumference. Visit http://www.boulder.swri.edu/recent/pluto_map.html for more information on this image. Credit: Eliot Young (Southwest Research Institute), Richard Binzel (Massachusetts Institute of Technology) and Keenan Crane (Boulder High School). Charon, smaller than Pluto, is even harder to image. 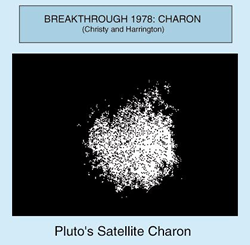 Marc Buie (then of Lowell Observatory) constructed this map of light and dark areas on Charon's Pluto-facing side from mutual events of Charon by Pluto. In July 2012, astronomers using NASA's Hubble Space Telescope reported the discovery of another moon orbiting Pluto – bringing the number of moons around Pluto to five. Estimates on the moon were 6 to 15 miles across, and in a 58,000-mile-diameter circular orbit assumed to be co-planar with the other satellites in the Pluto system. The observations were made to help scientists plan for the July 2015 flyby of Pluto by NASA's New Horizons spacecraft. Read more about the images. The fifth moon, marked "P5" in this images, was named Styx. The moon marked "P4" – discovered in 2011 – was later designated as Kerberos. Released in 2010, this is the most detailed view to date of the entire surface of Pluto, as constructed from multiple NASA Hubble Space Telescope photographs taken from 2002 to 2003. Hubble's view isn't sharp enough to see craters or mountains, if they exist on the surface, but Hubble reveals a complex-looking and variegated world with white, dark-orange, and charcoal-black terrain. The overall color is believed to be a result of ultraviolet radiation from the distant Sun breaking up methane that is present on Pluto's surface, leaving behind a dark, molasses-colored, carbon-rich residue. See the full collection of images here. What Is a Binary Planet? When the center-of-mass between two objects lies outside the surfaces of both objects, you have a "binary" object – and there are binary stars as well as planets and asteroids. It's this trait that makes Pluto-Charon a binary planet, where the Earth-moon pair (with a center-of-mass inside Earth) is not. 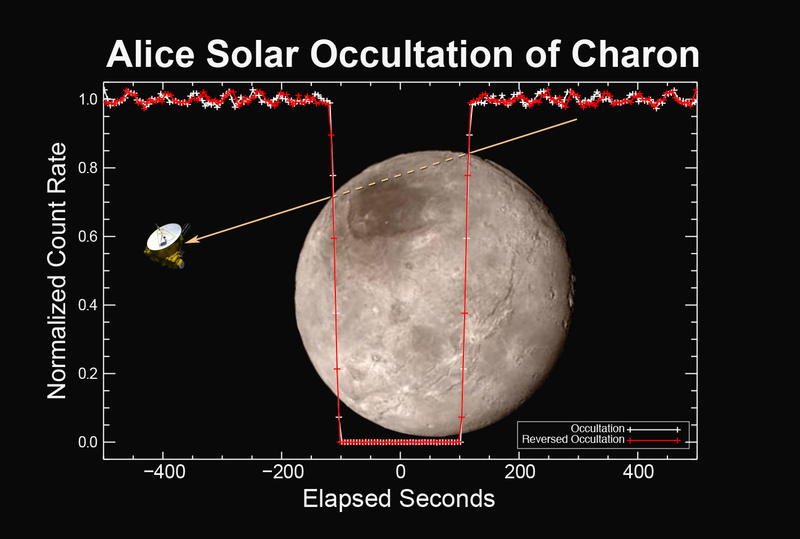 Below is a diagram and two movies that show the motion of Pluto and Charon in their orbits. These diagram shows the orientation of the orbits around the time in its 248-year orbit when Pluto was closest to the Sun (in 1989). For further discussion of this period of "mutual eclipses" click here. For orientations at different locations and times in Pluto's orbit, click here. Most Planets have north poles that point roughly up and out of their orbit planes - except Uranus and Pluto, which rotate on their "sides." Like most satellites, Charon orbits above Pluto's equator. 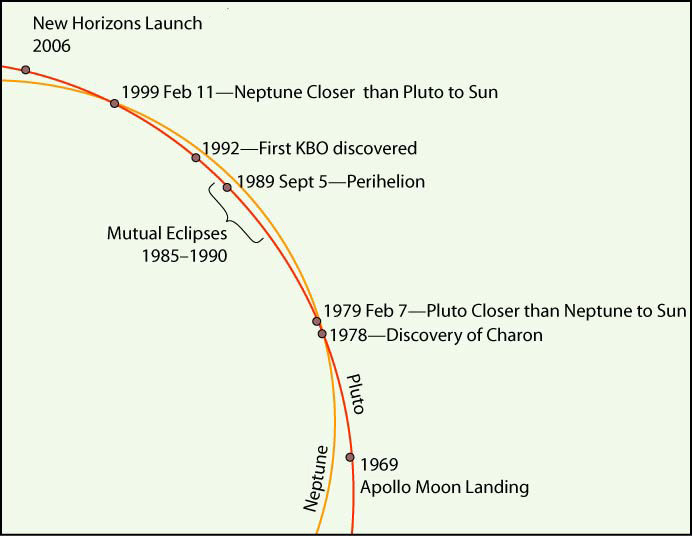 From 1985 through 1990 Pluto's equator and Charon's orbit plane were aligned with the line of sight from Earth. Charon would pass in front of Pluto every 6.4 days. Most satellites in our solar system are too small, compared to the planet they orbit, to put the balance point very far from the center of the primary body in the system. But the mass ratio of Pluto to Charon is just 8:1 (compared to typical planet:satellite mass ratios of 10,000:1), and the balance point of Pluto-Charon lies a few thousand kilometers above Pluto, toward Charon. Although Pluto-Charon is the only recognized binary planet in the solar system, there are binary asteroids and binary Kuiper Belt Objects. Of course, there are also many binary stars in the galaxy as well. New Horizons is expected to be the first mission to visit any kind of binary object. Click here to make a model of the Pluto/Charon system. The Moon is a familiar object in our night sky, and the Apollo astronauts' photos have shown us what the Earth looks like from the Moon. 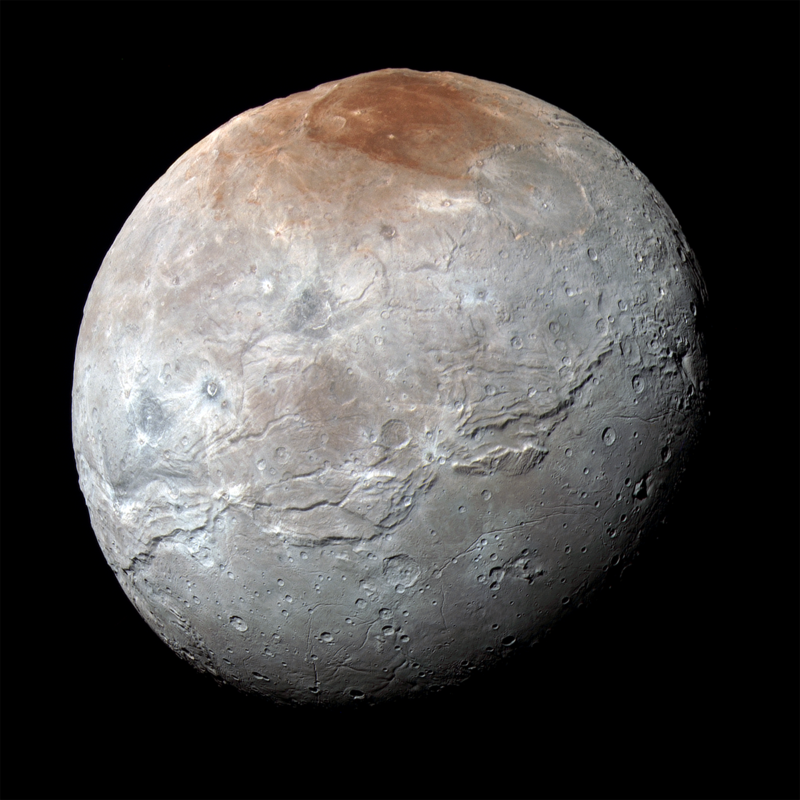 What would Charon look like from Pluto, or Pluto from Charon? Charon is about half of Pluto's size and located about 17 "Pluto radii" away. This means that the disk of Charon is about 3.5 degrees across when seen from Pluto, and Pluto is twice that size (7 degrees) when seen from Charon. This diagram shows one way to measure angles with your fingers. 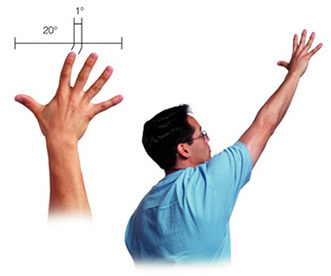 If you hold your arm out toward the sky, the width of a finger is about 1 degree. This means that from Pluto the disk of Charon is about 3 or 4 fingers across. Our Moon (and Sun, coincidentally) is about one-half of a degree across - the width of a skinny pinky finger. From Charon, the disk of Pluto is wider than an outstretched fist. Wouldn't that be an amazing sight in the sky! We are used to the Moon rising and setting every day, mainly due to Earth's daily spin. We also know how the Moon's appearance changes over a month. The 29 1/2-day lunar cycle of phases stems from the changing illumination by the Sun as the Moon orbits Earth. Because the Moon's spin period is the same as its orbital period around Earth, the same face of the Moon always faces the Earth. We never get to see the "backside" of the Moon from our planet. Now try to think about what Charon would look like from Pluto - and Pluto from Charon. Just like our Moon, Charon's spin period is the same as its orbital period - 6.4 Earth days in Charon's case - and from Pluto you only see the one side of the moon. But Pluto also spins at the same 6.4-day rate, meaning that from Charon a person would only see one side of Pluto. This leads to an interesting situation - animated here - where a (red) person on the "backside" of Pluto never sees Charon and a (red) person on the "backside" of Charon never sees Pluto. Moreover, from any particular location on Pluto, Charon appears to stay in the same place in the night sky for the whole 6.4 days - and Pluto appears fixed in the sky when viewed from Charon. While Pluto/Charon does not appear to move when viewed from Charon/Pluto, the illumination by the Sun does change. So, both Pluto and Charon go through a 6.4-day cycle of phases. 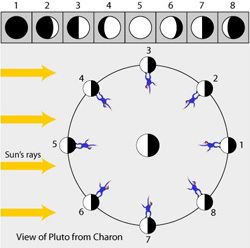 In this diagram the top panel shows the cycle of phases seen by the (blue) person on Pluto looking up at Charon at times 1-8 over the 6.4-day cycle. 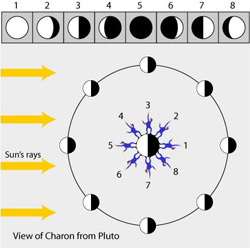 In this diagram the top panel shows the cycle of phases seen by the (blue) person on Charon looking up at Pluto at times 1-8 over the 6.4-day cycle. The tilt of Pluto's spin (and Charon's orbit) leads to more subtle changes in the phases over Pluto's full year. New Horizons science team member Marc Buie of Southwest Research Institute shows more of these effects on phases of Charon on his website. Because objects in the outer solar system never come between Earth and the Sun, we never see their "backsides" and so we'd never see a new or crescent Pluto from Earth. Wherever we are in our orbit around the Sun we'd see the sunlit side of a Pluto and it always looks nearly full. What a shame! We can detect if Pluto's surface is smooth or rough by looking at it during different phases, just as you can tell the difference between a ball bearing and a cotton ball by how they reflect light at different angles. By flying behind Pluto - as scientists plan - the New Horizons spacecraft will take pictures of Pluto in phases we could never see from Earth. 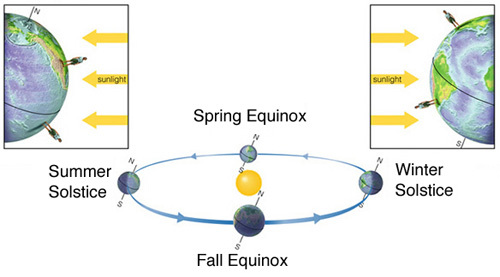 Seasons on Earth are mainly caused by the 23-degree tilt of its spin axis. This axis points in a fixed direction toward Polaris (also known as the North Star or Pole Star). The diagram shows an oblique view of Earth's roughly circular orbit. Because Earth's axis tilts with respect to its orbital plane, the angle of the sunlight we receive in different places over the globe changes during the year. From March until September, when the North Pole points toward the Sun, the days are longer, the Sun is higher in the Northern Hemisphere, and we have northern summer and southern winter. Because Earth's orbit is very close to circular, the slight change in distance between the Earth and the Sun does not cause any appreciable change in sunlight. In fact, we are slightly closer to the Sun in December than we are in July. This diagram refers to seasons experienced in the Northern Hemisphere. The Southern Hemisphere has equinox (equal night and day) at the same time, but experiences winter while it's summer in the north and vice versa. Both tilt and distance affect seasons on Pluto. The planet's spin axis is nearly "sideways," tilted over 120 degrees, so the tilt alone leads to extreme seasons on Pluto. And because Pluto's eccentric orbit swings it between 29.7 and 49.3 astronomical units from the Sun, the amount of sunlight varies by a factor of 280% over a Pluto year (rather than just a 5% variation on Earth). Since planets move faster when closer to the Sun, Pluto's northern fall lasts much longer than the quickly passing northern spring. Pluto's estimated surface temperature is about minus 387 degrees Fahrenheit (that's minus 233 degrees Celsius or about 40 Kelvin). Because it is so cold on the surface of Pluto nearly every material is frozen solid! Click here to learn more about the frigid conditions at Pluto. Starting in the 1970s, technological advances in telescopes and other instruments brought tiny, faint Pluto within range for Earth-bound observers. In 1975, using the light-analysis technique called spectroscopy, astronomers Dale Cruikshank, David Morrison and Carl Pilcher measured a portion of Pluto's infrared spectrum using one of the then-largest telescopes on Earth. They aimed the 4-meter Mayall Telescope and its powerful spectrometer (located at Kitt Peak National Observatory in Arizona) at Pluto and recorded the signature, or spectral fingerprint, of frozen methane. This discovery was the first indication that Pluto's surface is icy rather than rocky, and opened an era of investigations into the realm of small, icy, outer solar system objects that continues today. Working with other colleagues, Cruikshank (now a New Horizons team member) later discovered the frozen nitrogen and carbon monoxide, as well as evidence for the colored organic chemicals that make up Pluto's surface. 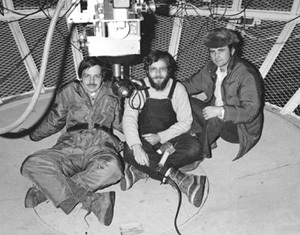 In this photo, from left, Morrison, Pilcher and Cruikshank sit in the Cassegrain "cage" inside the giant telescope. The instrument with which they detected methane ice on Pluto hangs just above their heads. Since then, new generations of instruments have dramatically improved our knowledge of Pluto's (and Charon's) composition. This section of the infrared spectrum of Pluto shows the signatures of some of the ices making up its surface. The black dots indicate the "dips," or low points, in this spectrum tracing that are identified with specific ices, as shown. CH4 signifies methane ice, while N2 and CO indicate frozen nitrogen and carbon monoxide, respectively. Although this spectrum incorporates one entire hemisphere of Pluto, the Ralph instrument (and its LEISA component) on New Horizons is designed to collect similar data from regions as small as a few kilometers in size all over the planet and on Charon. "Geometric Albedo" is a measure of Pluto's brightness, while "Wavelength" denotes the region of the spectrum. The wavelengths in this spectrum are two to five times longer than those that can be seen with the human eye. 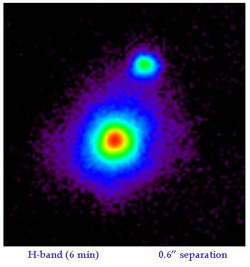 This spectrum was obtained with the 3.8-meter United Kingdom Infrared Telescope (UKIRT) at Mauna Kea Observatories, Hawaii, by Thomas R. Geballe, Tobias Owen, Dale Cruikshank, and Catherine de Bergh. An analysis of some parts of the spectrum was published by S. Doute, et al., in Icarus 142, 421, 1999. From the New Horizons mission, we now have details maps of Pluto's surface composition. We know that volatile ices preferentially accumulate in the topographic low of Sputnik Planitia. These ices include N2, Ch4 and CO, species that are gaseous on Earth but can exist in a solid state at the cold temperatures on Pluto's surface. We have also directly detected water ice on Pluto's surface from New Horizons data with the LEISA component of the Ralph instrument. The spectral signature of water ice had not been detected from Earth-based observations. Water ice would behave like rock at the temperatures of Pluto's surface. The most significant signature of water ice is near Pulfrich crater east of Sputnik Planitia and along Virgil Fossa. Pluto demonstrates a latitudinal pattern in reflectivity (with a dark band around the equator) and brighter terrain at the north pole. A latitudinal pattern is also seen in the distribution of surface composition across Pluto (ignoring Sputnik Planitia). This latitudinal pattern is a result of how much sunlight falls on Pluto's surface. The north pole is enriched in CH4 ice because this region has been sunlit since 1987 and has received more solar illumination than any other latitude. This has caused the more volatile N2 ice to sublimate from the north pole and condense in colder areas. Occasionally Pluto will cross in front of a reasonably bright star - an event called a stellar occultation. 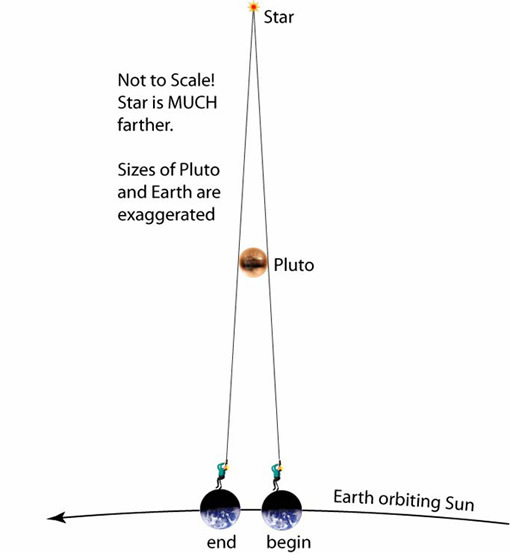 The diagram below shows how the orbital motion of the Earth changes the perspective of an observer looking at Pluto. From the perspective of an observer on Earth the star appears to move behind Pluto. From beginning to end the occultation of the star by Pluto only lasts a couple of minutes. An important stellar occultation by Pluto occurred in June 1988 and provided the first direct evidence of Pluto's atmosphere. If Pluto had no atmosphere the starlight would blink instantly off and then back on again at the end. For a brief time at the beginning and end of the occultation, however, Pluto's atmosphere was backlit by the star and the starlight dimmed more gradually. By carefully modeling how the atmosphere "bent" the starlight - called refraction - researchers detected the planet's tenuous atmosphere. 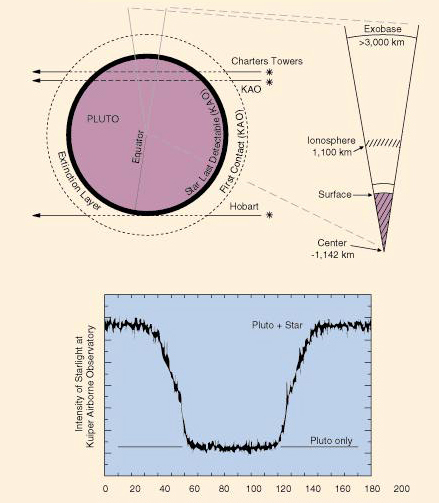 Several research groups observed the 1988 stellar occultation by Pluto using telescopes on Earth - such as in Hobart, Tasmania and Charters Towers, South Africa - and from a plane, the Kuiper Airborne Observatory. Pluto's is one of four known atmospheres in the solar system that is predominantly molecular nitrogen. The others belong to Saturn's largest moon, Titan; to Neptune's largest moon, Triton; and to Earth. Like its solar system twin, Triton, Pluto's thin atmosphere has a surface pressure of only 10 microbars (100,000 times less than the surface pressure of the Earth). The temperatures are extremely cold, with surface temperature in the range of minus-400 to minus-360 degrees Fahrenheit. The atmosphere is controlled by interaction with surface ices, primarily molecular nitrogen ice. Pluto's ices slowly evaporate from the surface and enter the atmosphere as gases, much in the way that ice cubes evaporate in the freezer of a refrigerator. 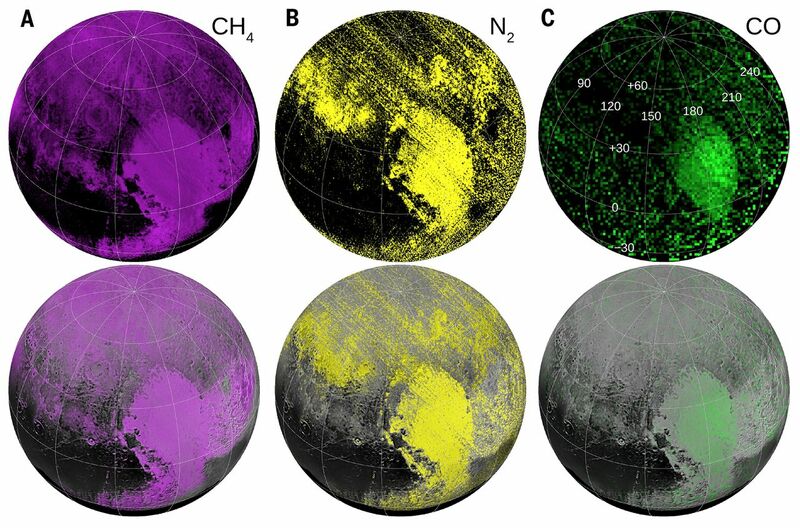 Ices of nitrogen, carbon monoxide and methane have been detected on Pluto's surface using telescope measurements of reflected sunlight (at near infrared wavelengths). New Horizons found that Pluto's atmosphere is predominantly nitrogen at low altitude, near the surface, but its main constituents are both nitrogen and methane at high altitudes above 1000 km. The atmosphere also contains trace amounts of carbon monoxide. All three atmospheric gases are supplied by sublimation of their ices. Look carefully at the gradual dimming of starlight shown in the occultation data in the plot above - do you see a slight bend or kink in the curve? You might also notice that starlight does not penetrate all the way to Pluto's surface, a fact that has led some scientists to suggest that obscuring clouds and/or haze mask the surface. The dimming of the starlight could also be explained by a very steep temperature gradient in the lower atmosphere, where the temperature increases from -397 to -360 F at the surface to -280 F in less than 10 kilometers (about 6 miles) of altitude increase. New Horizons found that Pluto's atmosphere actually has just the steep temperature gradient needed to explain the stellar occultation data. However, New Horizons also discovered thin haze layers in Pluto's atmosphere using images taken from behind Pluto, looking back toward the Sun. These haze layers do not cause enough obscuration to mask the surface. The large tilt in Pluto's rotational axis (120 degrees) creates very large seasonal variations. As surface ices evaporate in the migrating sunlight, their gases are transported and redeposited in dark, cold surface regions as frost. At the same time, in other locations on the planet or as Pluto's seasons change, some of the gases of the atmosphere freeze on the surface, causing a slow but continuous exchange of materials between the surface and the atmosphere. This constantly refreshes the surface, perhaps covering much of the planet's topography with freshly deposited ices on time scales of thousands of years. Thus, even frigid, distant and tiny Pluto is a dynamic world where the processes of nature continuously change the surface and the atmosphere, creating an alien and exotic world that beckons us from Earth to visit, explore and learn. 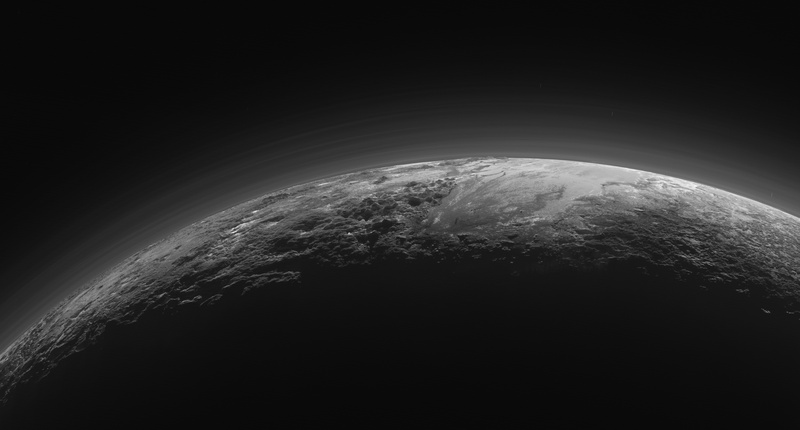 An Atmospheric "Freeze Out" on Pluto? Pluto is currently moving away from the Sun, having reached its closest approach distance in 1989. Generally, the closer an object is to the Sun, the warmer it should be and the more rapidly its surface ice should sublime into space. The sublime of ices on the surface of Pluto is responsible for its tenuous atmosphere. As Pluto moves away from the Sun it will get colder and, eventually, its atmosphere will almost completely condense back onto the surface. The actual situation is a bit more complicated than the simple illustration discussed above. Because of "thermal lag," the time of Pluto's closest approach to the Sun in 1989 was probably not when its surface temperature was greatest, just as the temperature on Earth is hottest at mid-afternoon rather than noon, or high summer is about a month after solstice. In the case of Pluto, the latest observations reveal that the atmosphere has thickened during the past decade. But this trend will definitely reverse as Pluto continues moving away from the Sun. Scientists don't know exactly when the condensation will start to dominate sublimation - which is why they wanted to get to Pluto as soon as possible! This figure shows how the Alice instrument count rate changed over time during the sunset and sunrise observations. The count rate is largest when the line of sight to the sun is outside of the atmosphere at the start and end times. Molecular nitrogen (N2) starts absorbing sunlight in the upper reaches of Pluto's atmosphere, decreasing as the spacecraft approaches the planet's shadow. As the occultation progresses, atmospheric methane and hydrocarbons can also absorb the sunlight and further decrease the count rate. When the spacecraft is totally in Pluto's shadow the count rate goes to zero. 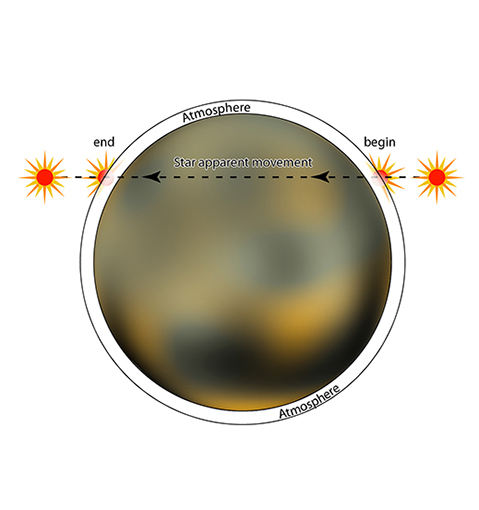 As the spacecraft emerges from Pluto's shadow into sunrise, the process is reversed. By plotting the observed count rate in the reverse time direction, it is seen that the atmospheres on opposite sides of Pluto are nearly identical. After flying by Pluto, the New Horizons spacecraft entered Pluto's shadow. As the spacecraft moved into Pluto's shadow, sunlight passed through the planet's atmosphere before reaching the spacecraft. Absorption of sunlight by Pluto's atmosphere was detected as characteristic "dips" in the ultraviolet part of the spectrum of light measured by New Horizons' Alice instrument. This technique is a very powerful method for measuring even trace amounts of atmospheric gas. This was the first observation of Pluto's atmosphere at altitudes higher than 170 miles above the planet's surface (270 kilometers). In addition, radio waves sent from Earth to New Horizons bent as they passed through Pluto's atmosphere. The amount of bending of the radio waves detected by the New Horizons Radio Science Experiment (called REX) is related to both the average molecular mass and the temperature of the atmosphere. Together, these ultraviolet and radio "occultation experiments" provided powerful probes of Pluto's tenuous atmosphere. Does Charon Have an Atmosphere? New Horizons observed the Sun pass behind Charon when the spacecraft flew through Charon's shadow to search for an atmosphere. To a better sensitivity than ever attained before, found no evidence for a present day atmosphere. As shown in this figure of the brightness of the Sun as it set then rose behind Charon, the cutoff of the Sun is very sharp, indicating no absorption by an atmosphere. It is possible that Charon did have a substantial atmosphere, perhaps soon after it formed approximately 4.5 billion years ago. But with Charon's small mass and correspondingly small gravitational attraction, any atmosphere would "evaporate" into space (see discussion of sublimation on this page) on a relatively short time scale. What are their surfaces like? Are their bodies differentiation? That is, do they have dense cores surrounded by a layer of lighter material? We know some pieces of the puzzle but other pieces are still missing or poorly described. Uncertainties in the basic statistics of radius and density frustrate scientists' attempts to build models of the interiors of Pluto (especially) as well as Charon. This figure shows some ideas of their interiors. Given the large amount of rock and the planet's size, scientists expect that the process of the planet forming and the natural radioactivity of the rock inside will have heated the interior sufficiently to melt the ice and allow it to separate from the rock. The rock inside Pluto has likely settled into a core surrounded by a thick shell or mantle of ice, as illustrated in the figure. Pluto and Charon together are estimated to be about 65% to 70% rock (including metal) and about 30% to 35% ice or material close to ice in density, which could mean liquid water or organic matter. (The word "organic" here simply means carbon-bearing and does not imply "living.") Very volatile ices (nitrogen, methane and carbon monoxide) are concentrated at Pluto's surface, but whether they form a distinct crust is unknown. Ocean at the Edge of Forever? An intriguing possibility is that an ocean of liquid water underlies Pluto's icy shell. The ocean may be mixed with or overlie an organic-rich layer (not shown in the diagram). Could building blocks for life exist at this very edge of the solar system? There is evidence that icy moons of Jupiter and Saturn have hidden oceans, and our improved understanding of heat generation and transport in icy worlds makes this a real possibility for Pluto. Pluto's surface is far too cold for liquid water, but its interior is probably warm and maintained that way by the slow decay of naturally occurring elements such as uranium, potassium-40 and thorium. Enough heat is released that a water ocean may exist between the rocky core of Pluto and its thick outer layer of ice. 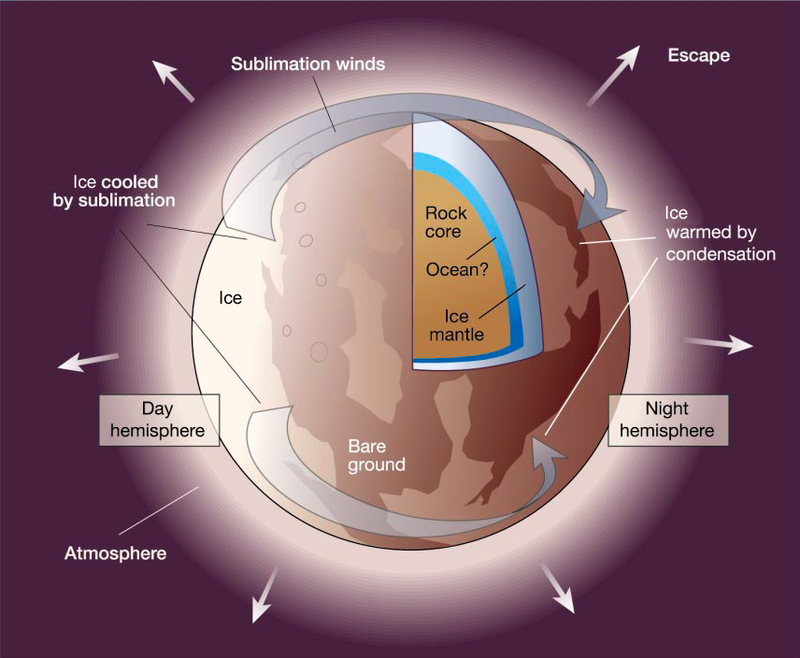 Planetary scientists have long thought that icy satellites might possess oceanic layers underneath their surface ice layers. The discovery by the Galileo orbiter that Europa, Callisto and possibly Ganymede possess interior oceans, along with similar inferences from the Cassini mission for Titan and Enceladus, greatly increases our expectation that Pluto also possesses an ocean. Pluto's ocean is also likely to contain biogenic elements in a solution, especially if it is in contact with an organic-rich layer. Where Pluto may not pass astrobiological muster is in the matter of sufficient energy to power life. Pluto's ocean would be dark and cold - near-freezing. Even if in contact with a rock core, it is likely that this modest core is today insufficiently hot to be volcanically active or even to drive hydrothermal circulations. So it is difficult to argue for a deep biosphere on Pluto today. On the other hand, it is also true that Pluto's rock core was much hotter and probably active in the geological past, so it is not unreasonable to speculate that some form of primitive, microbial life may have evolved long ago and just might have once plied the "Styxian seas" of Pluto. Since Charon is smaller and less dense than Pluto, its internal structure is simpler to model. But its smaller size, paradoxically, makes its internal structure more uncertain. 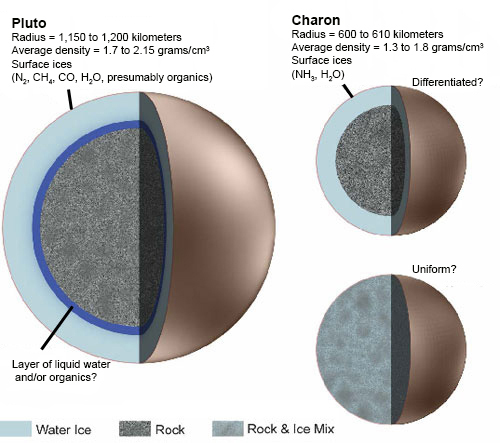 The figure above illustrates a Charon that is differentiated in a similar fashion to Pluto - separated into a mantle of ice and core of rock. But we also cannot rule out the possibility that Charon has a roughly uniform mixture of rock and ice all the way through - that is, undifferentiated - as in the lower figure, or something in between. New Horizons will help find out which (if any) of these ideas are correct by measuring the masses, densities and shapes of Pluto and Charon as well as searching for clues in the surface geology of "what lies beneath." During New Horizons' approach to Pluto, planetary scientists (and Plutophiles) have been trying to predict what the surface might look like. To do this they look at other bodies in the solar system that have the same general properties as Pluto. The surface of a solid planet records the history of its interior evolution, and also reflects the planet's composition. Icy worlds in our solar system seem to have surface features that are a little bit different from the features we see on terrestrial planets like Earth. So scientists look for an object with a similar size and composition as Pluto. 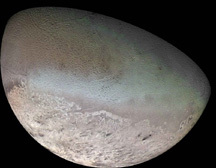 A good candidate for comparison to Pluto is Neptune's strange moon Triton. The interiors of both Pluto and Triton are likely composed primarily of water ice over a rocky core, and in roughly similar amounts. Both are a little bit smaller than our own moon (Triton's diameter is 2,700 kilometers, Pluto's is about 2,230 km). Their outer layers also have some amount of non-water ices such as methane, carbon dioxide and nitrogen, which are present on their surfaces and their thin atmospheres of nitrogen, methane and other minor gases replenished from sublime of ices from their surfaces. The portion of Triton viewed by Voyager 2 in 1989 at high resolution is geologically unique in several ways. This photomosaic shows Triton's southern hemisphere - the image is centered near 20 degrees north latitude, and Triton's equator runs approximately through the bright swath across the middle of the image. Images of Triton returned from the Voyager spacecraft show several types of terrain, including volcanic plains, zones of diapiric convection cells (the famous "cantaloupe terrain") and eroded plains. The southern hemisphere is covered in a terrain that defies explanation. A key Voyager observation was that there are very few impact craters, indicating an extremely young surface age of only a few million years! 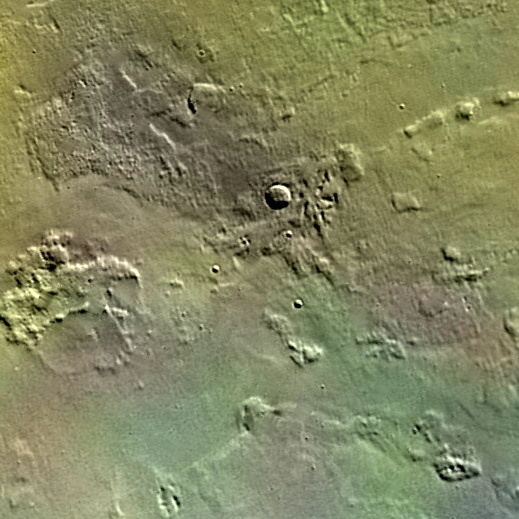 Another discovery on Triton was the thin geysers erupting from the southern terrains, one of which is shown here erupting from the surface. Images were taken with a resolution of about 1 kilometer. The vent is at right, which forms a broad fan blown westward at approximately 8 kilometers altitude by high winds. See other images of Triton here. 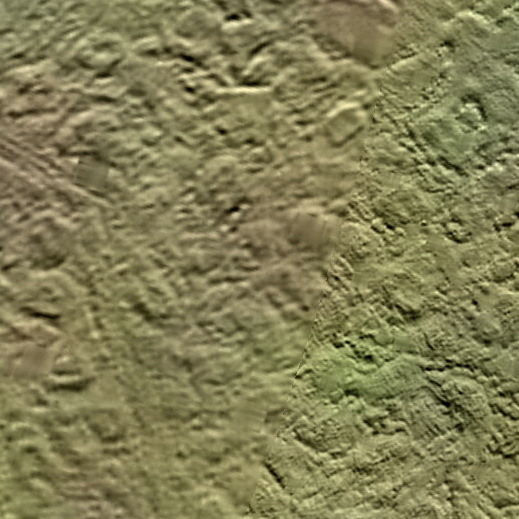 Global map of Triton at 650 meters per pixel resolution in three colors (orange, green and blue). A new global map of Triton using the best Voyager images available gives a preview of features we could see on Pluto. We should not expect Pluto to be a copy of Triton, however. 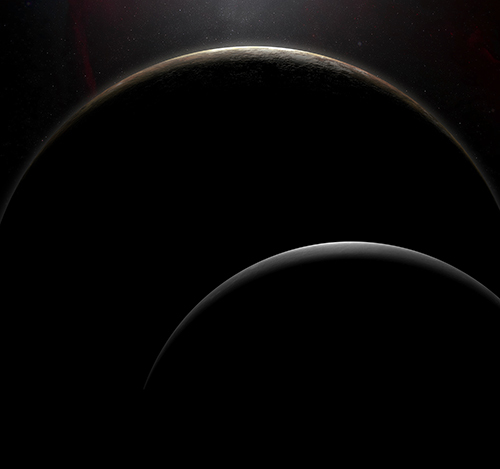 Pluto is much darker than Triton in some areas and there are many other differences. The only way to ascertain Pluto's geologic history, and that of its large moon Charon, is to go there and look up close – one of the key reasons New Horizons was sent to the edge of the solar system. Triton is in an unusual orbit around Neptune. It orbits in the opposite direction from Neptune's spin – a retrograde orbit – and its orbit is inclined relative to Neptune's equator. If Triton had formed around Neptune, its orbit should have been in the plane of Neptune's equator, and it would rotate around Neptune in the same direction as the planet. Scientists have suggested that Triton may be a Kuiper Belt Object that wandered too close to Neptune not long after formation and was captured into orbit. Something had to slow the proto-Triton down as it wandered past Neptune; one theory is that proto-Triton impacted one of Neptune's existing satellites and leftover debris formed Triton. Another possibility is that "gas drag" caused proto-Triton to slow down as it grazed through Neptune's atmosphere. In either case, a tremendous amount of heat would have been deposited in Triton's interior. That heat may not have been enough to explain the active surface we see today, but tidal forces from its lopsided orbit are powerful enough to keep the interior active, leading to eruptions of icy material onto the moon's surface and a redistribution of mass in its interior. Pluto is a member of the Kuiper Belt, and the giant impact that likely formed Charon may have disrupted Pluto's interior, just as the interior of protoTriton would have been disrupted when it impacted one of Neptune's satellites. As Pluto cooled down and the mass in its interior redistributed after the impact, interesting geology may have reformed its surface. 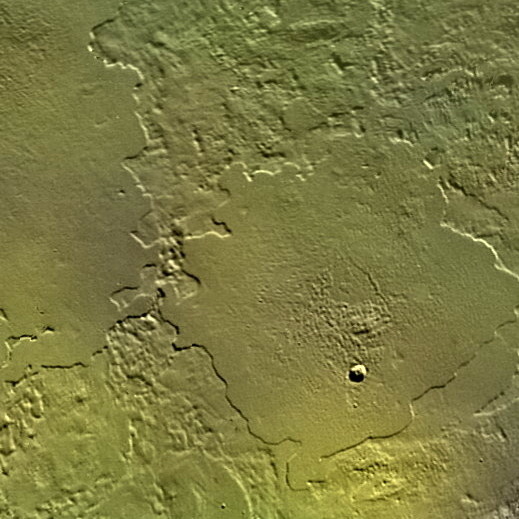 Because Pluto's composition is likely similar to Triton's, some of the features we see on Triton (such as the "cantaloupe terrain" and wind streaks shown in the figures above) may also exist on Pluto. The dark wind streaks detected by Voyager 2 on Triton's surface were tens to hundreds of kilometers long and preferentially pointed northeast, away from the south pole. The term "outer planets" refers to planets that orbit the Sun beyond the Asteroid Belt, including Jupiter, Saturn, Uranus, Neptune and Pluto. The inner planets are Mercury, Venus, Earth and Mars. There are small, rocky inner planets (Mercury, Venus, Earth and Mars-sometimes called the terrestrial planets); giant, gas outer planets (Jupiter, Saturn, Uranus and Neptune, also called jovian planets); and dwarf planets, such as Pluto and Ceres. Pluto and its moon Charon have solid surfaces but, unlike the terrestrial planets, a significant portion of their mass is icy material (such as frozen water, carbon dioxide, molecular nitrogen, methane and carbon monoxide). Pluto and Charon are widely considered to be among the largest objects in the Kuiper Belt, a vast reservoir of icy objects located just outside of Neptune's orbit and extending out to about 50 astronomical units from the Sun. The Kuiper Belt is thought to be the source of most short-period comets - those with orbits shorter than 200 years - so scientists really want to compare the composition and surface properties of Pluto and Charon to those of cometary nuclei. 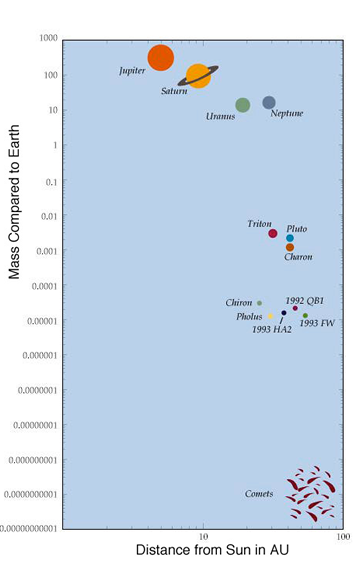 This mass vs. distance plot of outer solar system objects shows the enormous range in sizes of these bodies, from Jupiter (318 times the mass of the Earth) to comets (less than 1 billionth of Earth's mass). Pluto, Charon and Neptune's moon Triton fall in the 1/100 to 1/1000 Earth-mass range. Notice that some Kuiper Belt Objects (such as 1992 QB1, 1993 FW, 1993 HA2) appear to be much smaller than planets but much larger than comets. Why are there only three types of planets? Why not a class for medium-sized planets? The reason relies on two basic facts of solar system formation. In the large cloud of gas from which the solar system formed, 1) the temperature decreased farther away from the Sun (just as it feels cooler when you move away from a campfire) and 2) the amounts of different elements varied according to a well-defined distribution (the cosmic abundance of elements). The most abundant element in the universe (by far) is hydrogen; the next-most abundant chemically reactive (not inert) element is oxygen. Combine them and you get H2O - water. As the disk-shaped cloud of gas around the young Sun began to cool, relatively small amounts of metals and rocks began to condense. Farther out, beyond the "snow line" where temperatures were cooler, water ice condensed into "snow flakes." These flakes bumped into each other, sometimes sticking to make snowballs. As the snowballs bumped into each other and grew, a few snowballs had accumulated enough mass that their gravity could hold on to hydrogen, the lightest as well as the most abundant element. Very rapidly the bigger snowballs became giant planets. Inside the "snow line" (thought to be at about 3-5 astronomical units) it was too warm for the abundant water to condense; it remained as a vapor. Only the metals and rocks condensed - and since these elements are rare in the cosmic abundance, there was not much material to condense. Hence, in the inner solar system we only have small, rocky planets. In the outermost solar system, beyond the giant planets, not only did water freeze but so did other abundant molecules (such as carbon dioxide, methane and nitrogen). But there was just not enough "stuff" and/or time to accumulate objects larger than dwarf planets in the outer solar system. The satellites, or moons, orbit their parent planets. When there is more than one moon, one can refer to a "satellite system," the term used for all of the gas giant planets. Within a satellite system, the inclinations are often used to distinguish between moons that formed at the same time as the planet, creating something like a "miniature solar system" with the satellites orbiting in a plane nearly coincident with the equator of the planet, and moons that were captured later and whose orbital planes are highly inclined with respect to the planet's equator. The Jupiter system as a great example. Click here to learn more about Galilean satellites as regular satellites. One process is sublime and condensation. Pluto has three ices on its surface that also form its atmosphere: nitrogen, methane, and carbon monoxide. When the surface warms up, these ices can sublime into the atmosphere. When the surface gets cooler, the atmosphere condenses on the surface like frost on a window pane. Another process is photochemistry, or chemistry driven by photons (light). Bluer photons have more energy than red ones, and ultraviolet photons have enough energy to cause sunburns here on Earth, and to break chemical bonds in the frozen methane on Pluto's surface. When these bonds reform, they generally make molecules that are larger, darker and redder. Ice may also crack - making it brighter - or harden into large sheets, making it more transparent, like "black ice." How Can Ice Behave Like Rock? Ice can be much stronger than one might think. In general, however, the resistance of solid materials to mechanical failure (brittle fracture and faulting, or slow viscous creep) depends on: the strength of the chemical bonds that hold the solid's constituent atoms and molecules together; temperature; and, to a degree, the molecular weight of the atoms and molecules. The hydrogen bonds that link one water ice molecule with another are reasonably strong, but nowhere near as strong as the covalent and ionic bonds between the silicon, oxygen and metal atoms (much as magnesium) in rock. Increasing temperature disrupts these chemical bonds, and conversely, decreasing temperature increases strength. Thus, in the outer solar system, where temperatures can be quite low, ice can be much stronger than the ice in our refrigerators or that which flows down mountainsides as glaciers. It is a rigid, hard material, and can be thought of as the "bedrock" of Pluto and Charon's geology, while weaker, more volatile ices (like nitrogen and methane) can play the roles of condensable solid or soft, deformable surface material. Strictly speaking, though, cold water ice never achieves the bearing strength of cold basalt or granite, but on a subtler level, when calibrated against a material's elastic rigidity (resistance to shear deformation), water ice is one of the strongest materials known. The four main geological processes are impacts, volcanism, tectonics (cracking) and erosion. Impact craters: In the solar system's formative years, when there was a lot of material left over from making planets, collisions were frequent and violent impacts frequently bombarded the surfaces of planetary objects. Craters produced by these impacts are readily visible on Earth's Moon and other planetary objects. Observations of the Moon and dating of lunar rocks the Apollo astronauts brought back to Earth tells us the frequency of impacts seems to have dropped dramatically about 3.8 billion years ago. Measuring the density of craters on the surface of a planetary object allows scientists to estimate the surface's age and when it was "resurfaced." Volcanism: When the interior of a planetary object is heated (e.g., by the natural decay of radioactive elements or by tidal heating) then material underneath the surface melts and sometimes erupts onto the surface. On the terrestrial planets we are familiar with volcanos erupting molten rock as lava. On objects whose outer layers are ice rather than rock it can be water or other liquids that flow onto the surface, or sometimes gases that vent. The volcanism of these low temperature ices is called cryo-volcanism. Tectonics: Any kind of cracking of a brittle surface layer that happens when the crust of a planet is stressed. Sometimes the stresses are caused by shrinking or expanding of the surface layer as the object cools down or heats up. Sometimes the cracks are associated with volcanic activity. Earth is the only planet that currently exhibits an extreme form of tectonics - plate tectonics - where the whole crust of the Earth is turned over and reworked every few hundred million years. On a planetary scale erosion is a minor process but it can produce dramatic features (such as the Grand Canyon). The most effective agent of erosion is liquid water, though wind and ice can also cause erosion. The temperature of a planet is mainly controlled by how much energy it gets from the Sun, which depends on the albedo (reflectivity) of the surface and its distance from the Sun. A planet gets more energy if it is closer to the Sun and reflects less sunlight back into space. To balance this, the planet also radiates energy in the infrared. The hotter the planet, the more energy it radiates. At some temperature, the incoming energy balances the outgoing energy. This is the "effective temperature." For a body without an atmosphere, like the Moon, this is the surface temperature. Pluto has both reflective (bright) and absorbing (dark) patches. In general, scientists expect the the dark areas to be hotter than the bright ones (like walking on blacktop on the way to the beach -- ouch!). But on Pluto, frozen nitrogen sublimes from sunlit spots and recondenses on shadowy spots. It takes a lot of energy to sublime ice - this is why, for example, it takes lots of stove fuel to melt snow for your soup on a winter camping trip. Evaporation also takes energy, so you get chilly going out with wet hair. On Pluto, the transport of ice from one part of the planet to another also transports energy, tending to keep frost at a single temperature. If the atmosphere absorbs and radiates in the infrared, then the effective temperature corresponds to the temperature somewhere in the atmosphere, and the surface can be quite a bit hotter. On Earth, the average surface temperature is about 60° Fahrenheit (15° Celsius), but the effective temperature is only minus-4° Fahrenheit (minus-20° Celsius). This is called the greenhouse effect. Pluto probably formed around the same time as the Sun and the other planets. The best estimate for the age of the solar system, and thus the age of Pluto, comes from radiometric dating of meteorites found on Earth. Analysis of radioactive isotopes in these meteorites all give the same answer: that the solar system is approximately 4.6 billion years old. Although there was presumably some variation in the formation times of the planets, circumstantial evidence suggests that the smaller objects all formed within a million years or so of the Sun. Thus, our best estimate for Pluto's age is 4.6 billion years. Planets end up with moons, or satellites, by several different mechanisms. Charon is so large compared to Pluto, and orbits so closely, that the leading theory for its formation is the same theory thought to account for the Earth's Moon — a giant impact. There is so much angular momentum in the orbits of Charon and Pluto and in the spin of Pluto, that Pluto and Charon could never have been part of a single, stable body. In other words, Pluto and Charon had to begin as independent worlds, though not necessarily the same ones we see today! A relatively slow, off-center collision by two comparably sized protoplanets would have resulted in the disruption of both and the merger of most of the debris into a rapidly rotating Pluto, but about 10% of the total mass would remain in close orbit and reaccrete (coalesce) into what we now know as Charon. Tidal friction would then slow the spins of both Pluto and Charon down and expand the orbital distance between the two. That's the theory, anyway. Proving the impact part of such a scenario on a computer is difficult, and a matter of current research. The differences between Pluto and Charon, in density and composition, are essential clues to how (and indeed, if) giant impacts work, so the data returned by New Horizons will be crucial to understanding how both Pluto and Earth got their moons. The debate about whether Pluto is a planet - generated by recent detections of hundreds of planetary objects in the outer solar system - continues. Many planetary scientists consider Pluto a planet because it orbits the Sun and it is large enough that its own gravity has pulled it into a spherical shape. Others disagree. Science is often contentious this way as new information is digested. This kind of debate is healthy in science. Scientists, educators and members of the public gathered for the Great Planet Debate in August 2008. Recent discoveries of hundreds of small planets in the outer solar system have started a planetary debate. These objects are thought to be part of a large collection of Pluto-sized and smaller bodies that forms a disk-shaped cloud of both small and large bodies beyond Pluto's orbit called the Kuiper Belt. To learn more about the solar system classification and the discussions of Pluto as a planet, visit Yes, Pluto really is a Planet. Charon is Pluto's largest moon. With a diameter of 753 miles, Charon is slightly over half of Pluto's 1477 mile diameter, making it the largest known moon relative to its parent planet in our solar system. Pluto and Charon both orbit a common center of mass which lies between them, blurring the distinction between planet and moon. Properly speaking, Pluto and Charon are a double planet. 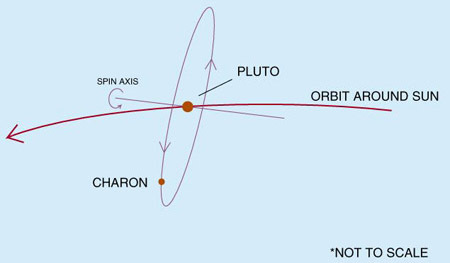 Tidal interactions between Pluto and Charon have damped their mutual orbit to be circular, and slowed their spins about their axes to exactly match the 6.4 day period of their mutual orbit. Thus the same face of Pluto is always oriented toward Charon, and the same face of Charon is always oriented toward Pluto. An observer living on Charon's Pluto-facing hemisphere would always see Pluto in the same place overhead, and vice versa for an observer on Pluto looking up at Charon. James Christy and Robert Harrington announced their discovery of Pluto's large moon on July 7, 1978. Christy proposed the name "Charon," after the mythological ferryman who carried souls across the river Acheron, one of the five mythical rivers that surrounded Pluto's underworld. Apart from the mythological connection for this name, Christy chose it because the first four letters also matched the name of his wife, Charlene. 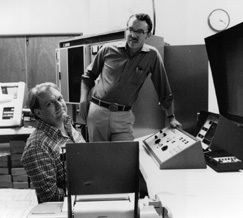 The New Horizons Science Operations Center at APL is named for James Christy — click here to read about it. Charon was discovered in June 1978 by James Christy and Robert Harrington. The images were taken at the U.S. Naval Observatory Flagstaff Station in Arizona – only about six miles from where Pluto was discovered at Lowell Observatory. They weren't even looking for satellites of Pluto - they were trying to refine Pluto's orbit around the Sun! Charon was discovered when sharp-eyed Christy noticed the images of Pluto were strangely elongated - it looked like Pluto had an irregular blob attached to its side. Perhaps the telescope was joggled when the picture was taken? No, that possibility was quickly eliminated by noticing that the other stars on the photo were round. Moreover, the blob itself seemed to move around Pluto; the direction of elongation cycled back and forth over 6.39 days - Pluto's rotation period. From this, Christy, after being checked by Harrington, concluded that Pluto either possessed a mountain thousands of kilometers high or a satellite in a synchronous orbit. Searching through their archives of Pluto images taken years before, Christy found more cases where Pluto appeared strangely elongated. Working independently, Christy measured the angle (from north) where the elongations appeared while Harrington calculated what the answer "should be" if the elongation was caused by an orbiting satellite. When the anxious moment came for them to compare their answers, they found perfect agreement. Just to be sure, they waited for the Naval Observatory 60-inch telescope to make one more confirmation. And sure enough, on July 2, new images showed the elongation due to a satellite right where it was supposed to be. They announced their discovery to the world on July 7, 1978. 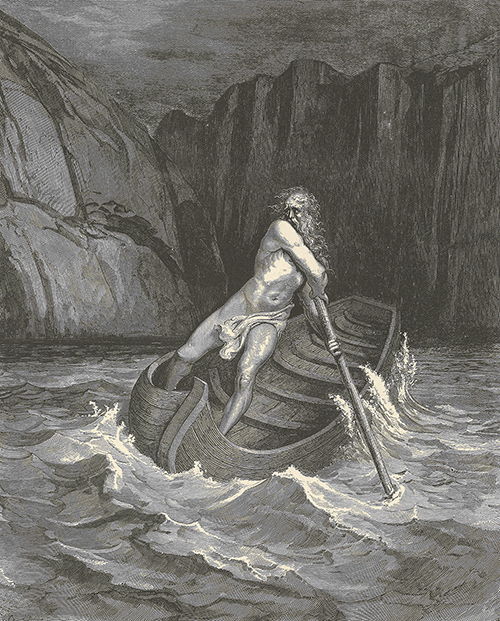 Christy proposed the name "Charon," after the mythological ferryman who carried souls across the river Acheron, one of the five mythical rivers that surrounded Pluto's underworld. Apart from the mythological connection for this name, Christy chose it because the first four letters also matched the name of his wife, Charlene. Charon's satellite status was finally confirmed when Pluto and Charon began a series of mutual eclipses in 1985. Later, Hubble Space Telescope and even advanced ground-based telescopes were able to spot Charon orbiting nearby — just 1/4,000 of a degree from Pluto! 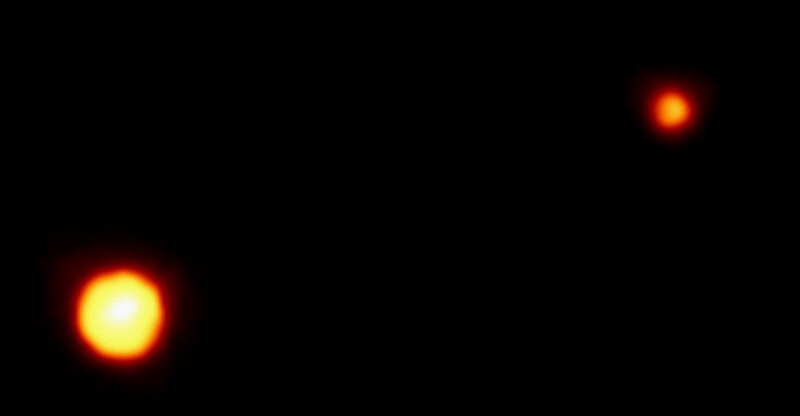 This 1994 Hubble Space Telescope/Faint Object Camera image of Pluto and Charon was the first to show Charon as a separate object. 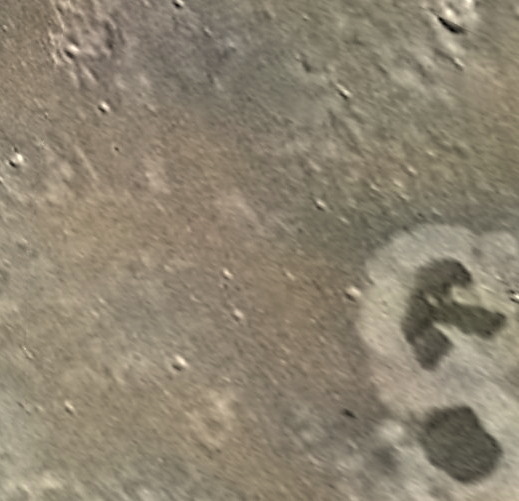 New Horizons revealed an array of spectacular features on Charon. A belt of jagged mountains and canyons slices across the encounter (Pluto-facing) hemisphere of Charon, dividing a rugged, cratered northern hemisphere informally known as Oz Terra from a smoother, lower-lying southern hemisphere informally known as Vulcan Planitia. 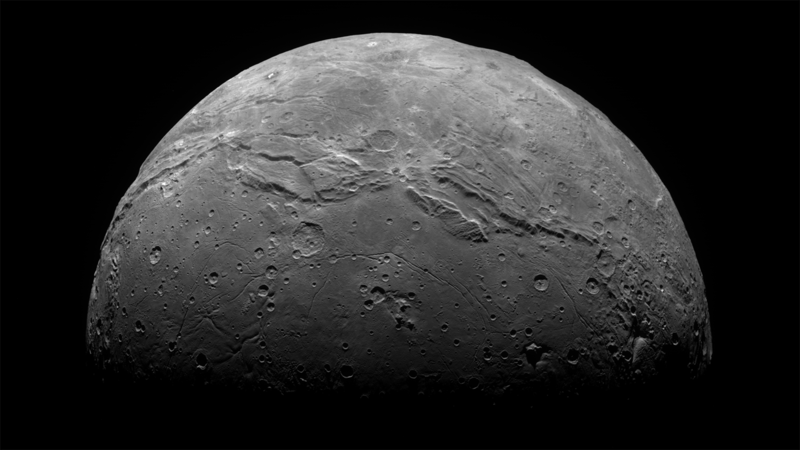 A massive eruption of molten material early in Charon's history is thought to have resurfaced Vulcan Planitia, producing a number of strange-looking landforms such as mountains surrounded by moats and a variety of cracks and wrinkles. 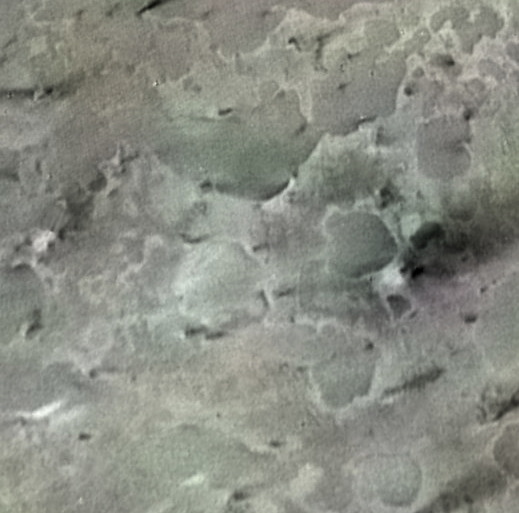 Charon's surface is mostly composed of dirty water ice. However, the polar regions are painted with reddish complex organic material that was produced from gas escaping from Pluto's atmosphere that was caught by Charon's gravity as it streamed away from nearby Pluto. Charon and the small satellites are thought to have formed in the aftermath of a giant collision early in solar system history. Earth's moon is thought to have formed in a similar way. According to International Astronomical Union rules, Pluto's moons are named for characters associated with the underworld of Greek and Roman mythology. 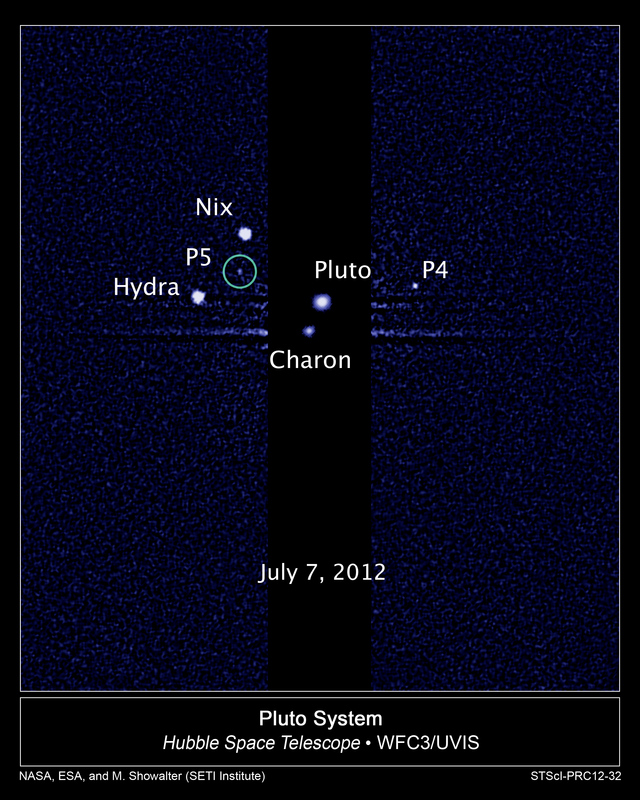 In 2006, the nine-member team that discovered Pluto's two smaller moons (initially designated P2 and P3) in June 2005 christened the pair Nyx and Hydra; because asteroid 3908 already bears the Greek name Nyx, the IAU changed Nyx to its Egyptian equivalent, Nix. In mythology, Nix is the goddess of darkness and night, befitting a satellite orbiting distant Pluto, the god of the underworld. Nix is also the mother of Charon, relevant to the giant impact believed to have created Pluto's satellites, indicating Charon was borne of the material from which Nix formed. 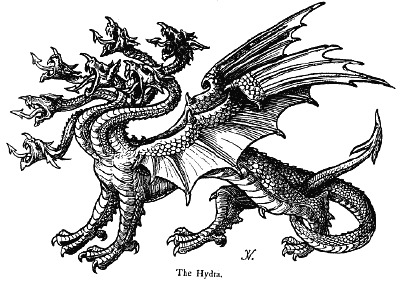 Hydra is the terrifying monster with the body of a serpent and nine heads, befitting the outermost moon of Pluto, the ninth planet discovered in the solar system. 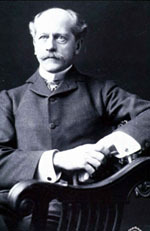 In addition, just as Pluto's name begins with the letters "P" and "L" to honor Percival Lowell, who motivated the search that led to its discovery, Nix and Hydra honor the search for new satellites and the New Horizons mission to Pluto by starting with the letters "N" and "H." The first letter of Hydra also honors the Hubble Space Telescope, which was used to detect the satellites. 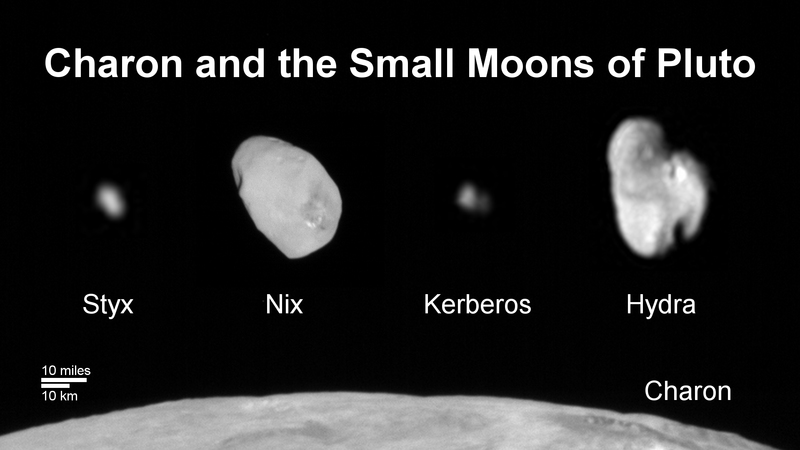 The IAU approved the names Kerberos and Styx for Pluto's two smallest moons – discovered in 2011 and 2012, respectively – in 2013. Kerberos was named after the three-headed dog of Greek mythology; Styx for the mythological river that separates the world of the living from the realm of the dead. The names were selected based on the results of an unprecedented Internet vote held in February 2012. The online ballot received almost 500,000 votes, including 30,000 write-in suggestions. 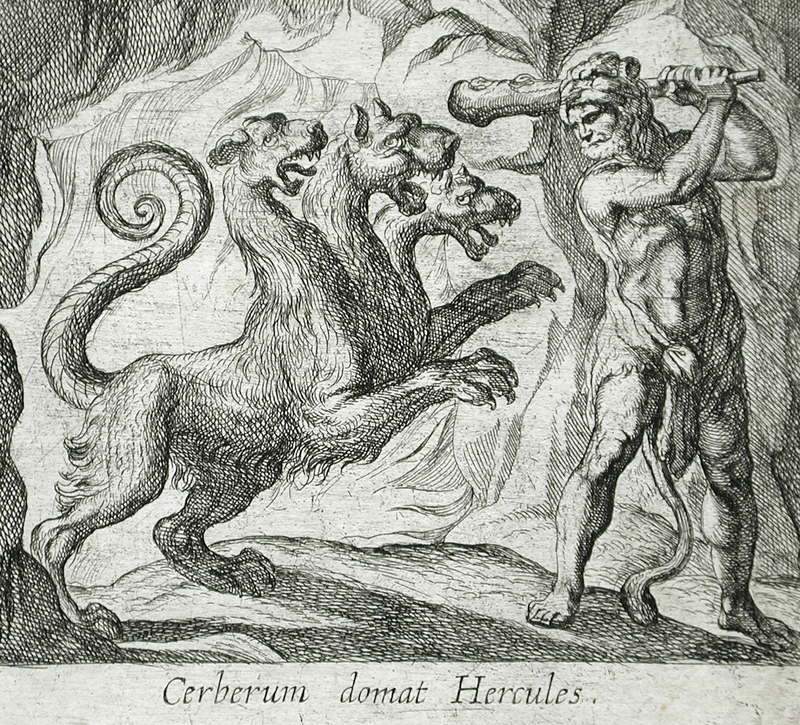 Kerberos is the Greek form of the name Cerberus, which actually ranked second in the voting. Styx ranked third. The top vote-getter was "Vulcan," based on a suggestion from actor William Shatner of TV's "Star Trek" fame. Vulcan was the name of the home planet of Star Trek character Mr. Spock. The IAU gave serious consideration to this name, which happens to be shared by the Roman god of volcanoes. However, because the name has already been used in astronomy, and because the Roman god is not closely associated with Pluto, the proposal was rejected. Scientists believe Pluto's entire moon system formed by a collision between Pluto and another planet-sized body early in the history of the solar system. The smashup flung material that coalesced into the family of satellites (five discovered so far) observed around Pluto. According to New Horizons Co-Investigator (and moon discoverer) Mark Showalter of the SETI Institute, "the moons form a series of neatly nested orbits, a bit like Russian dolls." Nix and Hydra were discovered in June 2005 by a large team of astronomers – led by New Horizons science team members Hal Weaver and Alan Stern – using the Hubble Space Telescope. 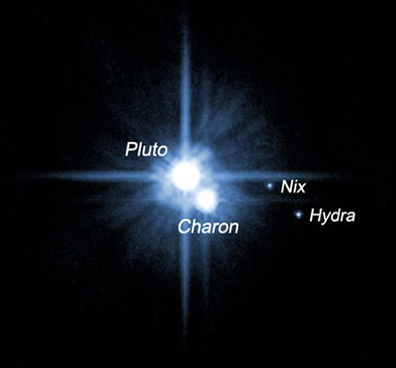 Nix and Hydra are roughly 5,000 times fainter than Pluto and are about two to three times farther from Pluto than its largest moon, Charon, which was discovered in 1978. Nix and Hydra are roughly 20 to 70 miles (32 to 113 kilometers) wide. 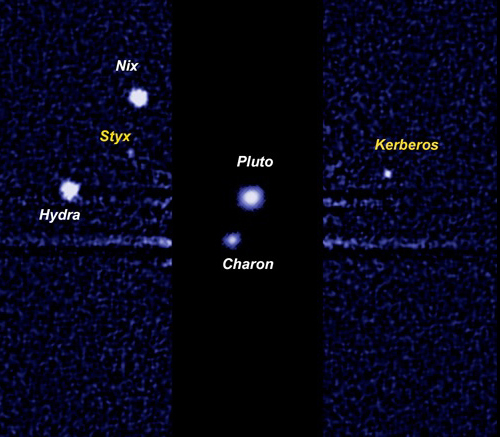 They are so small and so faint that scientists combined a short exposure of Pluto and Charon and a long exposure of Nix and Hydra to create images of them all together. Nix was named for the Greek goddess of darkness and night and mother of Charon; Hydra was named for the nine-headed serpent that Hercules fought in Greek and Roman mythology. Astronomers using the Hubble Space Telescope spotted a fourth moon orbiting Pluto while searching for rings around the dwarf planet. Kerberos was discovered on June 28, 2011, by a large team led by Mark Showalter. It was confirmed in subsequent Hubble pictures taken on July 3 and July 18. The moon was not seen in earlier Hubble images because the exposure times were shorter. 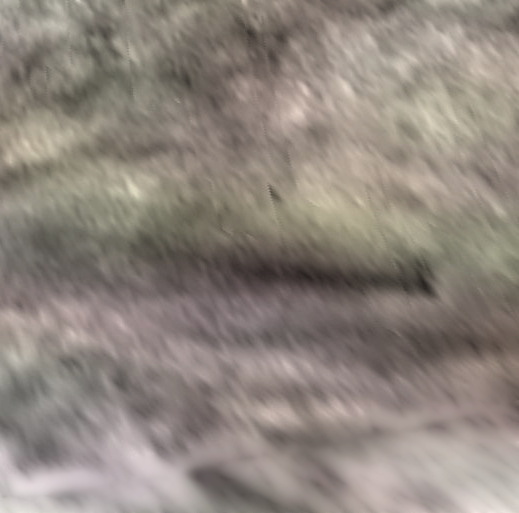 There is a chance it appeared as a very faint smudge in 2006 images, but was overlooked because it was obscured. Read more about the discovery. The moon was temporarily designated S/2011 (134340) 1 (and sometimes called "P4") and was officially named Kerberos by the International Astronomical Union (IAU) in 2013. Located between the orbits of Nix and Hydra, Kerberos has an estimated diameter of 8 to 21 miles (13 to 34 kilometers). The Hubble Space Telescope also figured in the discovery of Styx, Pluto's fifth moon, on June 26, 2012. Styx was uncovered by a Showalter-led team using Hubble in a searching for potential hazards New Horizons might encounter during its flyby of Pluto. Originally designated S/2012 (134340) 1 (and sometimes "P5"), the moon was officially designated Styx by the IAU in 2013. Styx is estimated to be 6 to 15 miles (10 to 24 kilometers) across. It is in a 58,000-mile-diameter circular orbit around Pluto that is in the same plane as the other satellites in the system. The LORRI camera on New Horizons snapped closeup images of Pluto's four small moons. They are all irregularly-shaped, elongated bodies, ranging in diameter from 10-15 km for Styx up to 50-65 km for Hydra. Kerberos appears to be shaped like a peanut, suggesting that it may have formed when two smaller bodies collided and merged. 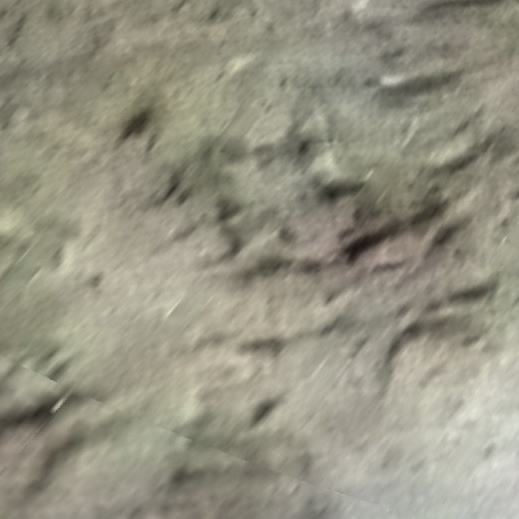 The moons, have old, heavily cratered surfaces. All are somewhat brighter than was anticipated, suggesting that they may be composed largely of water ice. Perhaps their most surprising feature is that all four moons are spinning very rapidly. Whereas nearly every other moon in the solar system keeps one face toward its central planet, like Earth's Moon does, the moons of Pluto spin many times each time they circle the planet. Hydra is the fastest, rotating in just ten hours, for 89 rotations during each of its 38-day trips around Pluto and Charon. Scientists do not yet understand the reason for the rapid spinning.